Hello, there - Remember me? It's been too long! Tom and I are 95% finished with our renovation here in Maryland. We're almost done in Maine, too. The pace of the last ten months has been fast and furious. Let's back up to September 2016. We sold our historic house in Castine, Maine (the one with the hydrangea hedge), and began gutting another property in the same town - a circa 1863 cottage by the sea. 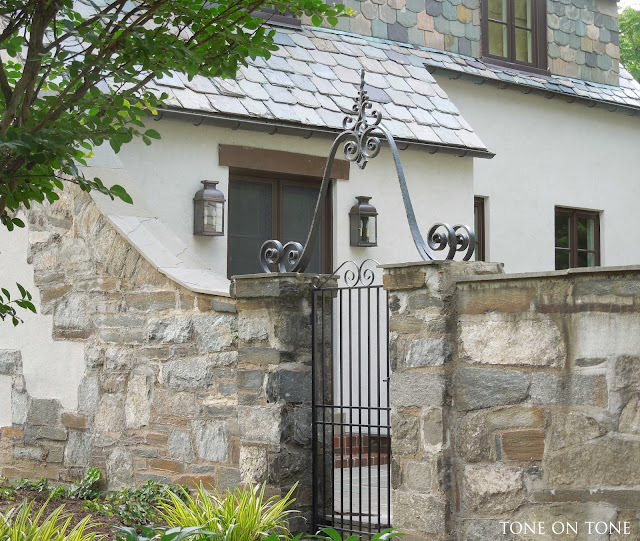 In December, we acquired a Cotswold-style stucco cottage in Maryland, and immediately started renovating it. Yes, we were crazy enough to renovate two houses at the same time! In February of 2017, our brick Tudor went on the market and sold - see my post here. Then this spring we moved into the Cotswold cottage despite not having a kitchen. Tom did set up a make-do kitchenette in a spare bathroom. Picture a microwave over a mini fridge located inside the shower stall along with a hotplate next to the sink. Not pretty! Thank goodness we finally have a working kitchen today (minus the dishwasher). And over Memorial Day weekend, Tom and I moved furniture up to Castine. Whew! That's it, NO more moves for us!! Now you are all caught up. I'm excited to share peeks of both homes just in time for a summer house tour organized by a group of talented Instagram / blog friends. For those visiting via my friend Lizbeth at Home and Fabulous, welcome! Liz has such a chic style - please check out her blog if you aren't familiar with it. Let's tour our new homes. At our Cotswold-style cottage, we upgraded the electrical service as well as replaced all of the light fixtures inside and out. A pair of Suffork copper lanterns from Circa Lighting flank the French doors leading to a walled courtyard. The lanterns illuminate the courtyard beautifully - just in time for outdoor summer entertaining. 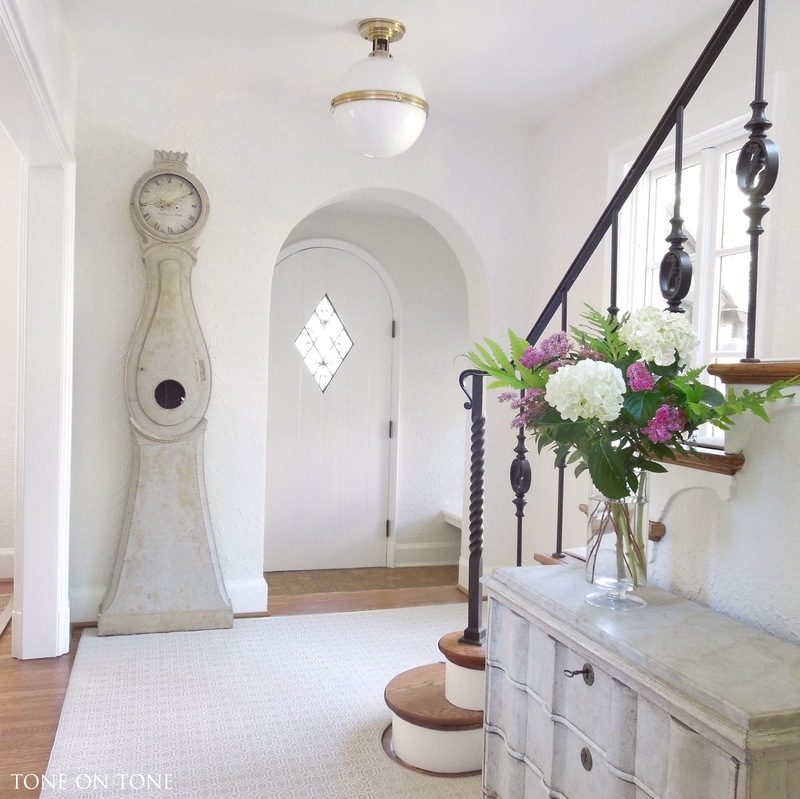 Inside, I also sourced this McCarren globe fixture from Circa for the foyer. By the way, this Swedish Mora clock has been in four of our homes - it's one of my favorite pieces. A summer arrangement of hydrangeas, spiraeas, and ferns fresh from our garden adds seasonal color. 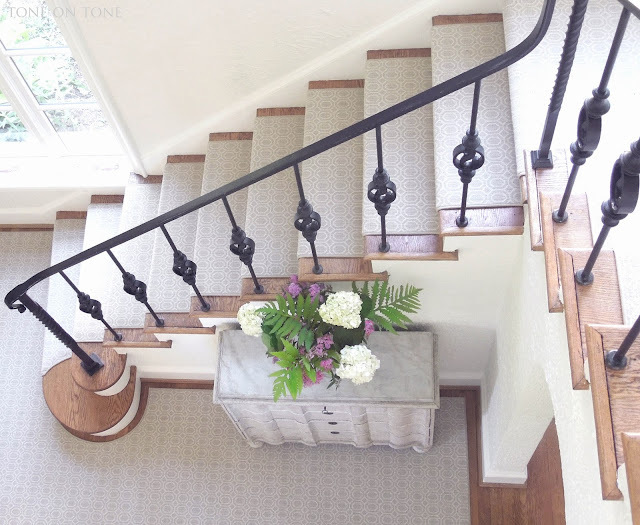 A view from above of our striking wrought iron staircase. Notice the seahorses adorning the railing - so unexpected and whimsical! I'd like to thank Carpet Creations (in Rockville, Maryland) for their excellent fabrication and installation of both stair and hall runners. They always do wonderful work. It's been ten years since I last purchased kitchen utensils and small appliances. 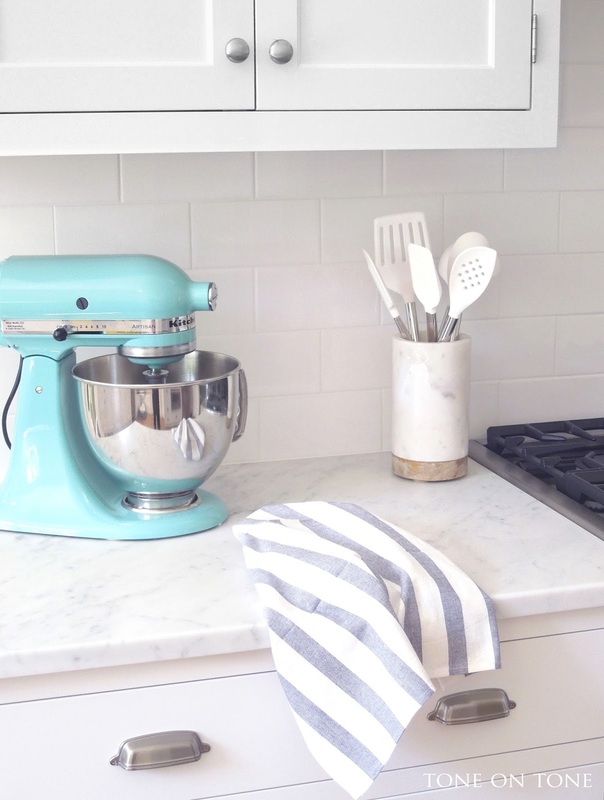 These new white ones, from Williams Sonoma, look especially stylish in a Crate and Barrel marble wine cooler, which complements the counters. And I just couldn't resist this aqua mixer - a fun splash of summer, don't you think? Here is our new kitchen. 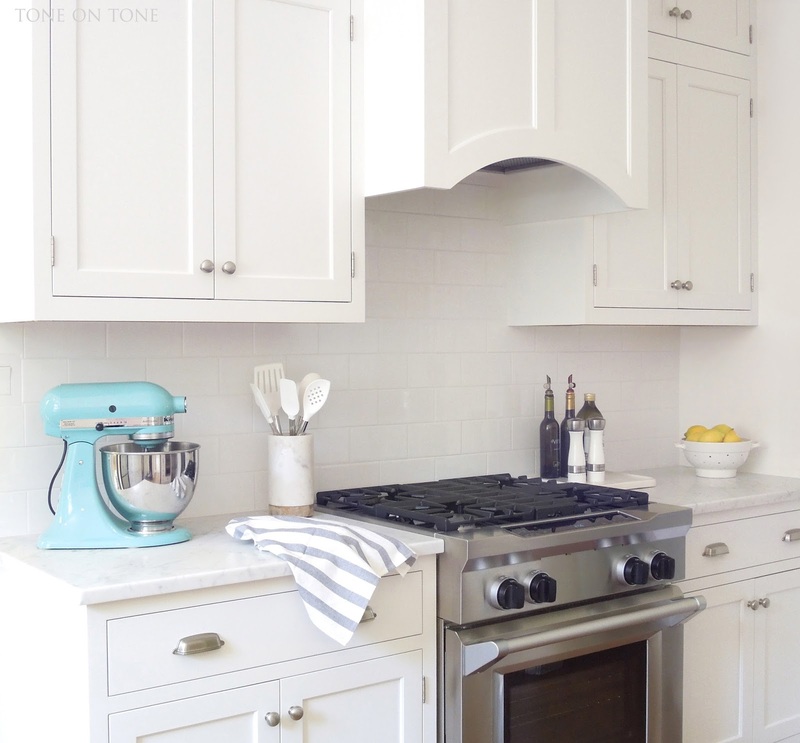 Once again, I selected classic Shaker-style recessed cabinet doors. The doors as well as drawers are inset (as opposed to overlay). 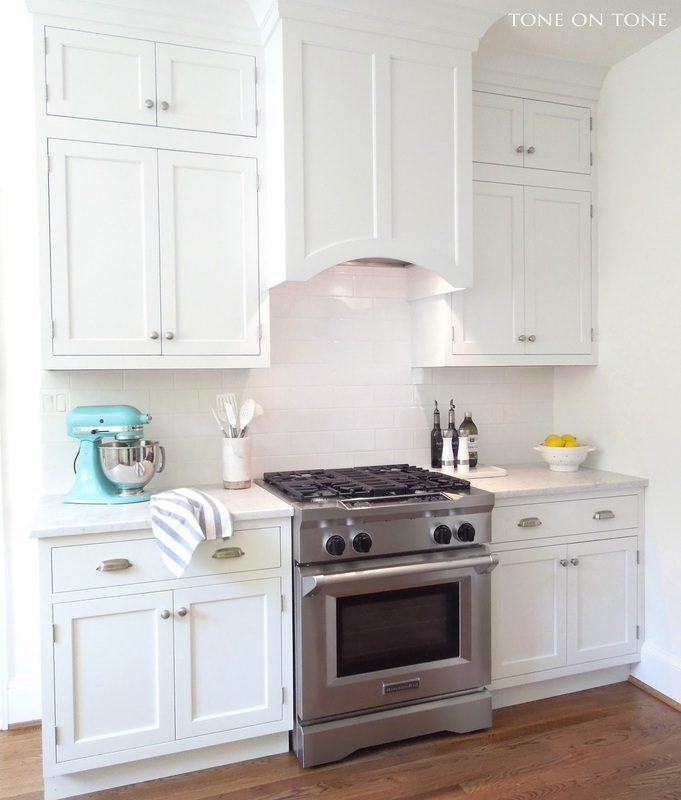 Notice the arched vent hood. Normally I wouldn't have chosen an arch, but want to reference the many architectural arches in our home. 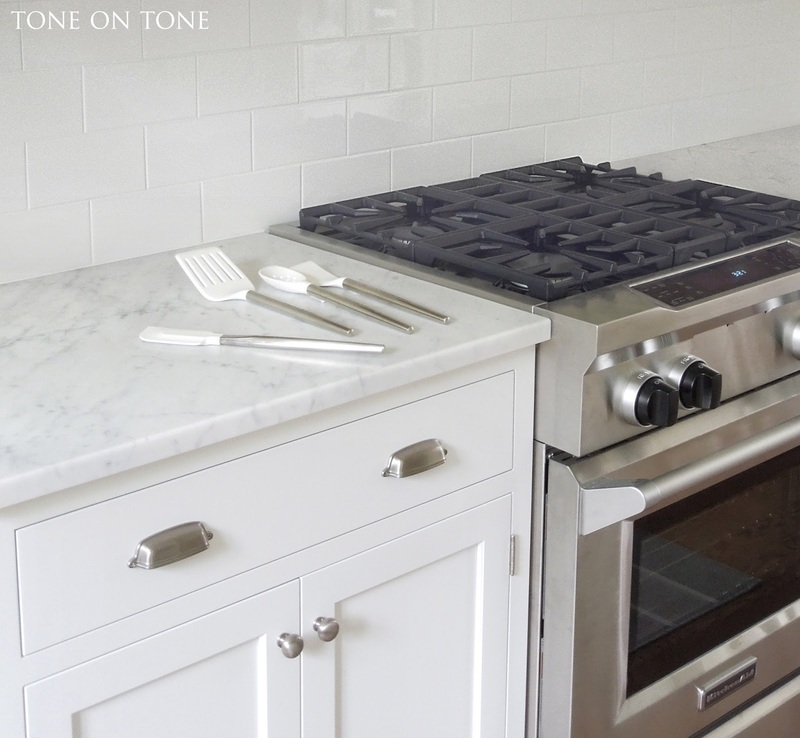 Counter tops are white Carrara marble with a honed finish. The 4" x 8" white subway tiles add texture plus sheen. 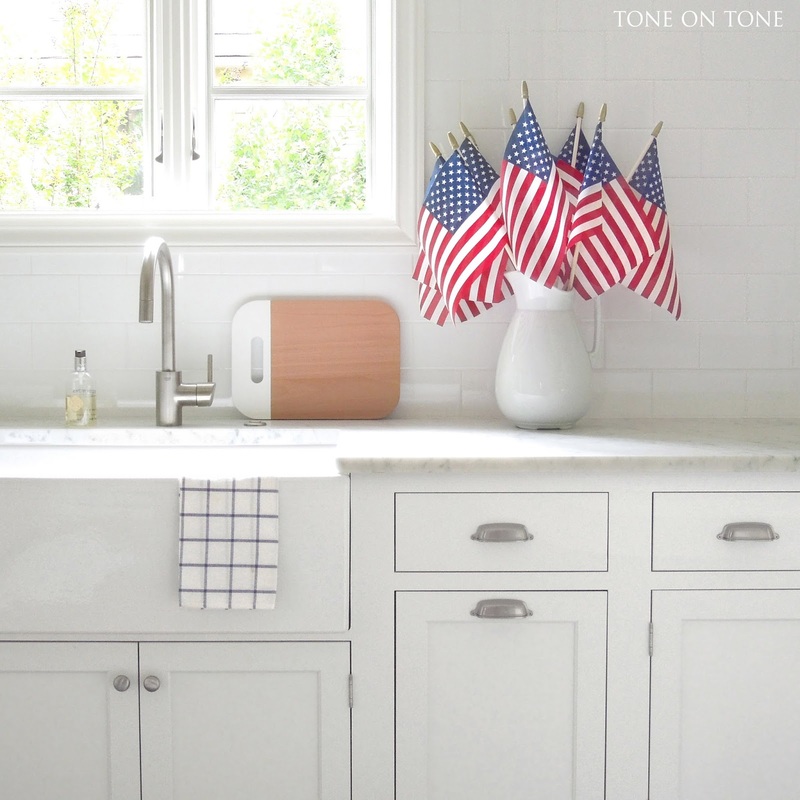 A festive arrangement of patriotic flags in a white ironstone pitcher all ready for the FOURTH! More kitchen photos to come. 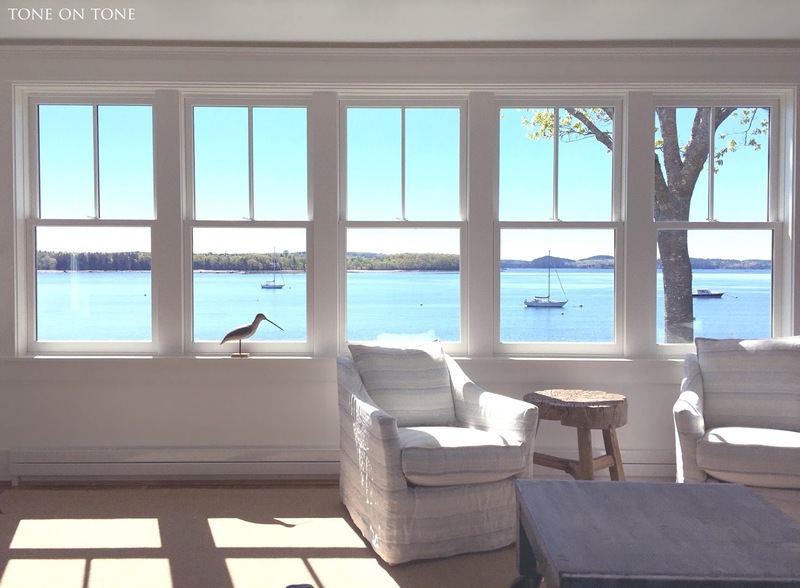 Now a sneak peek of our little cottage in Castine. I quickly snapped these photos with a rather old iPhone while we were moving in prior to styling or accessorizing. ABOVE: A view of the harbor shortly after sunrise. More boats will soon be moored here. 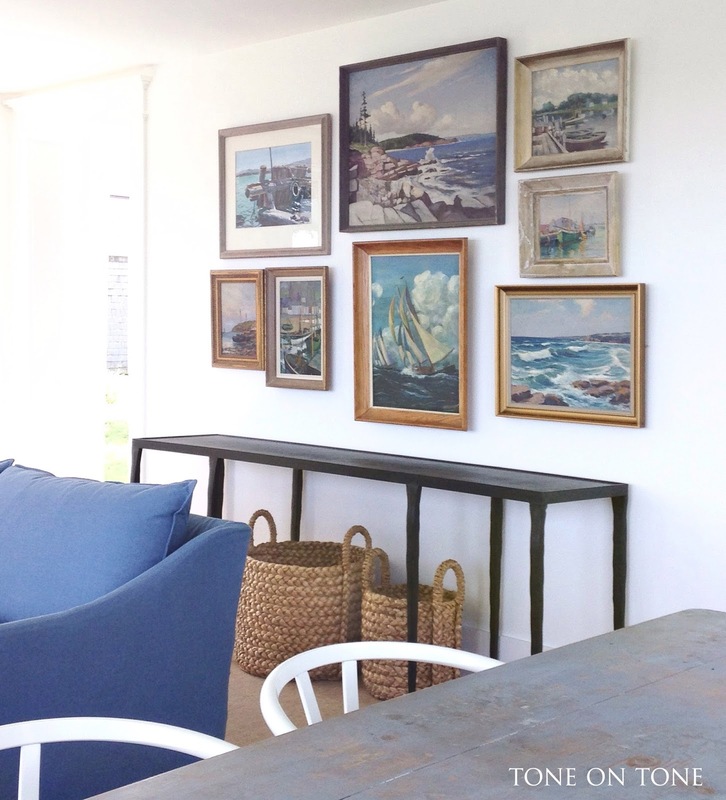 BELOW: This gallery wall features part of my collection of vintage seascapes, many found locally in Maine. I'm looking forward to accessorizing the console table. That's it for this time. Hope you've enjoyed seeing our new homes....check back for updates. Now please pop over to Maison de Cinq, my friend Sheila's blog to enjoy her summer tour. I can't wait for you to see Sheila's lovely home.